Albert Ganado & Antonio Espinosa Rodriguez: An Encyclpedia Of Artists With A Malta Connection. The idea of reviewing an encyclopedia seems both dull and daunting, yet neither of these adjectives proved appropriate for what turned out to be a fascinating and information-filled exercise. 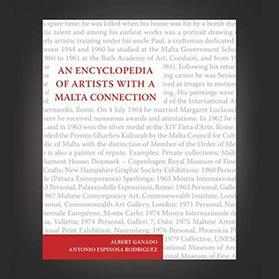 The book in question is Albert Ganado and Antonio Espinosa Rodriguez’s An Encyclopedia of Artists with a Malta Connection. Both authors are well- known and highly-respected figures in the realm of Malta’s artistic and cultural heritage. Espinosa Rodriguez has attained degrees in art history both locally and in the UK; his specialisation lies in 19th-century Maltese art and he has also served as a curator of fine arts with the museums department and, later, Heritage Malta. He was the founding curator of the Malta Maritime Museum whose daunting remit was maritime history from the earliest Mediterranean civilisations to the current period – a broad scope indeed. His fellow author was Albert Ganado, whose extensive collection of melitensia is legendary. Ganado will need no introduction to those readers interested not just in the cartography ofthe Maltese islands but also our arts, society and culture. He is, without doubt, one of Malta’s most prolific researchers and authors. As the title suggests, this encyclopedia includes artists who have been involved in our islands’ artistic patrimony in one way or another over the centuries; they have rooted out no less than 2,240 such individuals. These include not just painters and draughtsmen but engravers, lithographers, sculptors and even craftsmen; however, they have chosen not to include architects, believing that this profession deserves separate treatment. Their sweep has been extensive, listing artists from most European countries including Hungary and Russia as well as North America. This publication is international in the true sense of the word. This encyclopedia gives basic biographical details, the location of known major works, auction details (but not prices) where available and, of course, bibliographic sources. The authors do not comment on the artistic merit of an artist or a work of art. This is a sensible strategy since art appreciation is subject to fickle trends and, if this volume is to maintain its importance as an essential work of reference, it is wise to eschew opinions. The authors judiciously decided to feature only deceased artists, thus avoiding the intrusive vanity of living artists. Both authors were able to draw on their many years of expertise, experience and research into local themes, with Espinosa Rodriguez deriving much information on paintings in oil and watercolour from direct knowledge and local publications. Ganado’s extensive collection of newspaper cuttings and auction catalogues (including, for example, Belgravia Auction Gallery’s distinctive gold-coloured catalogues dating back to the founding of the auction house by Moses Sammut in 1971) provided a mass of data to trawl through for relevant information. Over the decades, Ganado has collected and developed a detailed knowledge of engravings and lithographs of Maltese subjects; these too have furnished a boundless source of material for this encyclopedia. Appropriately for an encyclopedia of artists, the illustrations include a number of portraits. Ganado recounted an amusing anecdote that demonstrated his dogged determination to be comprehensive. In 1995, he attended the five-day International Conference on the History of Cartography in Vienna. Aware that a print dealer specialising in portraits was located tantalisingly close to the conference venue, he took the opportunity, when the conference schedule featured subjects unrelated to his primary interest, to escape the conference and while away the hours searching for suitable material. The dealer was delighted to find a potential buyer who was so interested in his stock and started plying Ganado with boxes full of prints. When, after a few hours, the dealer asked whether he wanted to see more material, Ganado responded that once he had travelled this far he would like to see all the material available; the dealer’s enthusiasm must have wavered as he mounted the steps yet again to fetch another dusty box from the top shelf. One of the portraits discovered on this trip was that of Pierre Puget, the French sculptor, painter, architect and ship-builder to whom the fine marble head of St John the Baptist, in the eponymous Oratory in Valletta, has been traditionally attributed. This is certainly no superficial coffee table book but one to be sampled like a vintage wine. The book is crammed with fascinating detail; it includes all the usual suspects but, more importantly, it lists some barely known, obscure artists who nevertheless deserve a share of the limelight. These include artists such as Colonel Robert Goff (who married Beatrice Testaferrata-Abela), a watercolourist and printmaker practically unknown in our country; the variable and enigmatic Italian (or was he Sicilian?) Luigi Aspetti; and the unfortunate Hungarian aristocrat and amateur artist Count Ivan Forray de Soborsin who visited Malta in 1842 and died just 10 years later aged 35 and whose doting mother commissioned a lavishly published volume of her son’s drawings lithographed by fellow traveler Joszef Heicke. To those potential buyers who may hesitate to purchase this book because they already own a copy of Nicholas de Piro’s International Dictionary of Artists who Painted Malta, it is important to emphasise that the two publications approach their subjects from quite different perspectives and are, in fact, complementary rather than duplicative. While one is an important visual reference by which to identify an artist’s typical style, the other provides a mine of valuable information about the life and work of artists who have enriched our national artistic patrimony. The publisher, Fondazzjoni Patrimonju Malti, has maintained its customary high standards, however, two small quibbles would be the lack of any autobiographical details of the august authors and the absence of a list of illustrations. The co-authors recognise that a work of this nature can never be complete as new sources of information become available and, as artists pass away, thus they continue their herculean task and persist in gathering new information for a possible future supplement to the current volume.